The RPAV (Remotely Piloted Aerial Vehicles) Division is growing at a fast rate, and it was decided in the IAF to invest in simulators in order to give the operators the tools they need. 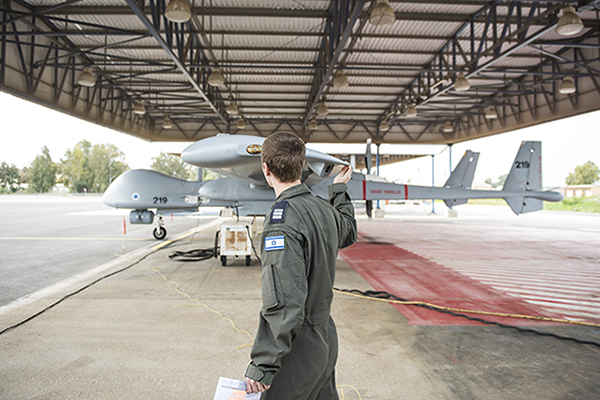 Members of the Simulator Squadron told the IAF Site about the development in the RPAV training field, and how there is still a long way to go. As I arrived at the RPAV (Remotely Piloted Aerial Vehicle) and Helicopter Training Squadron in Palmahim AFB, it felt as if I had traveled into the future. As I toured the simulators, I was overwhelmed with information and advanced technology. “Up until a few years ago, simulators were at a very basic level in the IAF”, explained Maj. A’, previously commander of the RPAV Training Center in the squadron. “As the division’s operational activity grows, so does the need for simulators. The division’s rate of development is unbelievable”. “There are two factors behind the RPAV Division’s growth in the field of training”, elaborated Lt. Col. (Res’) A’, previously commander of the 320th (RPAV and Helicopter Training) Squadron. “The first is our ability to construct scenarios which simulate operational reality at a very high level. The second factor relates to the fact that we live in an era of minimalism, questioning how we can get more using less. A simulated sortie is both cost-efficient and less dangerous than a real sortie”. Another benefit of simulated sorties is the ability to control the scenario. “When the training exercise is performed in the simulator, I can control the scenario and ensure that the operator undergoes the challenging process he needs to undergo, thus preparing him for operational activity,” detailed Maj. A’. “Today, less than 30 percent of the RPAV Division’s training sorties are performed in the simulator. We hope to reach 90 percent”, shared Lt. Col. (Res’) A’. “We will reach our goal in two steps. The first is to improve our existing simulators in the next two to three years. I would like to use the simulator to fly in areas in which I would fly during operational activity. The simulator’s databases do not simulate these areas at a high quality. If we upgrade the existing simulators, we can step up the number of training sorties”. The second step is to establish a divisional RPAV training center, similar to the Combat Division’s mission-based training center in Hatzor AFB. “A center of this sort will allow the RPAV Division to perform more than half of its sorties in the simulator”, emphasized Lt. Col. (Res’) A’. “Every year, either a new RPAV is integrated or an existing one is upgraded - as an instruction center, we can never stay behind. We need to accept the changes and make them instructional in order to give the operators all of the knowledge they need”, stated Maj. A’. Updates and changes in the simulators require lessons to be rewritten and all the operators to be trained accordingly. “The ‘Kochav’ (Hermes 900) RPAV, which was integrated into the IAF a year ago, is constantly being modified technically. Each technical modification is followed by an adjustment in instruction”, explained Maj. A’. “Another challenge is creating a realistic sense of operational activity in the simulator”, said Maj. A’. “This is caused by several parameters different to those in the Combat Division – there, the experience is physiological and affects the entire body. Here, the physiological sensations are different. The operator must stay attentive while receiving a lot of information on the radio and adjusting to the stick’s sensitivity. Monitoring a target for a long period is challenging. If the stick and the picture don’t match the sensation in the control station, then the drill isn’t good enough”. “Some drill sorties are configured ahead of time as part of routine activity and some of them are adjusted to the current operational status”, shared Lt. Col. (Res’) A’. “If there are any real incidents near the border, the simulator scenarios should be similar. The sorties in the simulator need to match the operational reality”. Maj. A’ added: “The process of planning an exercise begins with an operational need. Once every three months, the Planning Department and the different squadrons update us regarding their operational challenges. The updates can include recent emergencies or new changes in the system that need to be implemented”.